Speculating in the markets is hard. The psychological and intellectual challenges of producing good trades are immense. Unlike, blackjack, roulette, checkers or chess trading is an open-ended game, which, for now, is the only thing that gives us an edge over the machines. As inimitable Matt Levine of Bloomberg notes, “The computers won: DeepMind built a program called AlphaZero that learned chess on its own by playing against itself without human input and was the best player in the world within 24 hours. For good measure, it also learned shogi and Go the same way. “The Age of the Centaur is *Over* Skynet Goes Live,” is Tyler Cowen’s headline: A computer is now better off learning these games on its own rather than working with humans. You will continue to read articles about how Steven A. Cohen or Ray Dalio or other big famous investors are trying to program computers to think like them, but: Why? You wouldn’t program a chess computer to think like Magnus Carlsen; even if you succeeded perfectly, your Magnusbot would get demolished by AlphaZero. In domains like chess and Go, the computers can figure things out on their own, and the humans just get in the way. That may very well be the case, but profitable edges still exist, especially for relatively slow frequency, limited scale setups that retail traders tend to exploit. While the big players are engaged in an increasingly futile arms race, we as little guys like us can still collect crumbs off the table that can more than feed our needs. So without much ado, here is my list of 3 stupid mistakes we don’t have to make in MT4. 3. DO NOT Close out your MT4 platform with any EAs still attached to the chart. Make sure that all the charts are wiped clean and set to your default view. If you don’t do this, the moment you re-open the program it will begin spitting out whatever buy/sell orders your EA has programmed and you will spend the next few minutes scrambling to close out unnecessary losses. There are probably a million other rules that we should keep, but these are the three of the most egregious mistakes that yours truly has done, so learn from my mistakes and avoid the totally unnecessary losses. 1. Trade in 100 trade batches. You need at least 100 trades to determine if a strategy works or not, but unfortunately most traders won’t even make past 10. We get bored. We get scared. We absolutely hate bleeding money NOW even it means making money LATER. Mostly we just love to tinker. No one is more guilty of that than yours truly who would be much better off if I just let my systems trade. One piece of advice that may help. See what is the minimum amount of parameters that would make you leave the trade the f- alone and try to reduce your system to those factors. Then just trade win, lose or draw. Remember if you don’t have 100 of the same trade -- you got nothing. What’s the maximum lever factor you should use for forex? You are looking at it. Four times. Four times MAX. So if you are trading $10,000 of capital your maximum trade should be 40,000 units. 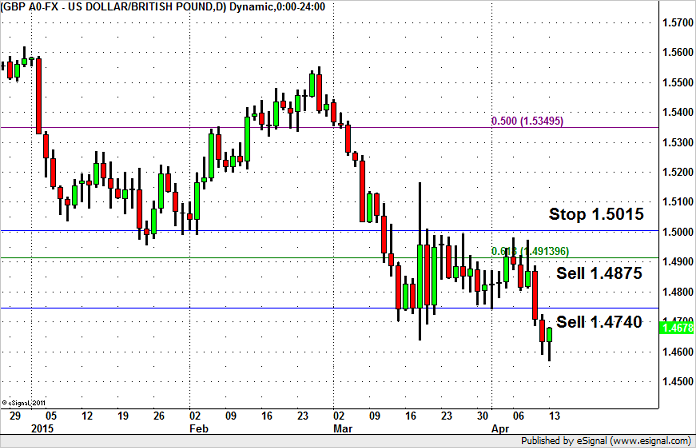 This assumes that your maximum stop is 25 pips. If your stop is bigger than that then you are not day trading -- you are day praying. Why 4X? At maximum size and maximum size you lose 1% per trade which is not going to bankrupt you even if you lose 10 times in a row. Try this for the next 100 trades you will do with your system and I am pretty confident you will still be in the game when the experiment is over. 3. Don’t lift the stop -- Ever. Chip away at your losses. Oh it’s soooo easy. The FX market is always whippy. Prices almost always reverse and that loss almost always turns to profit if you -- Just. Let. It. Float. Except when it doesn’t. And you keep adding and adding until the account is gone and you don’t even know how you got to that point from one single, stupid trade. When losing it’s ALWAYS better to stop out. If you like the trade you can always get back in and you won’t be carrying dead inventory if you are wrong again. Painful as it is to take a loss, it always better to chip away at it even one pip at a time. It took me 6 trades today to recover from a loss and it was worth every pip, both mentally and financially. Resolve to never lift a stop and you will always live to trade another day. We are currently short CAD/JPY on the premise that the Greek No vote will drive more volatility and risk aversion in the financial markets. Oil prices were hit hard today, falling as much as 6% and when combined with the slower acceleration in Canadian manufacturing activity, the vulnerabilities of Canada’s economy become abundantly clear. Later this week, Canada’s employment report is scheduled for release and given the drop in the employment component of IVEY PMI, we are looking for a downside surprise. Back to back to weakness in Canadian data coupled with the sell-off in oil spells big trouble for Canada’s economy and in turn the Canadian dollar. At the same time, the one clear and unambiguous impact of the Greek crisis is reduced expectations for Fed tightening. Between the decline in oil prices and global market uncertainty, U.S. policymakers may opt to delay liftoff to December. We are still months away from the September FOMC but for the time being, the potential for a delayed rate hike could keep USD/JPY and in turn under pressure and minimize the impact of positive U.S. economic reports. 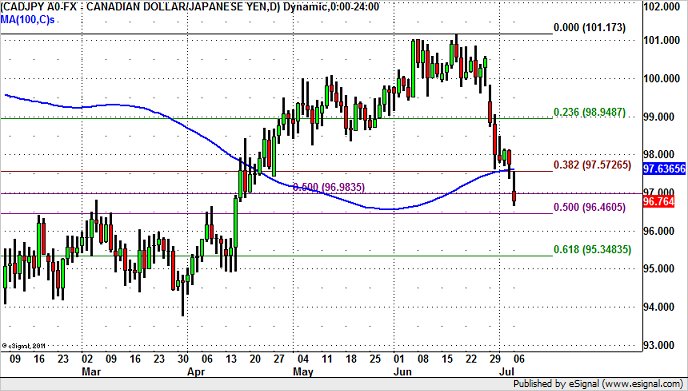 Technically today’s break in CAD/JPY has taken the currency pair below 3 significant support levels. The first was the 100-day SMA, the second was the 38.2% Fibonacci retracement of January low to June high and the third was probably the most significant -- the 50% Fibonacci retracement of 2007 to 2009 decline. 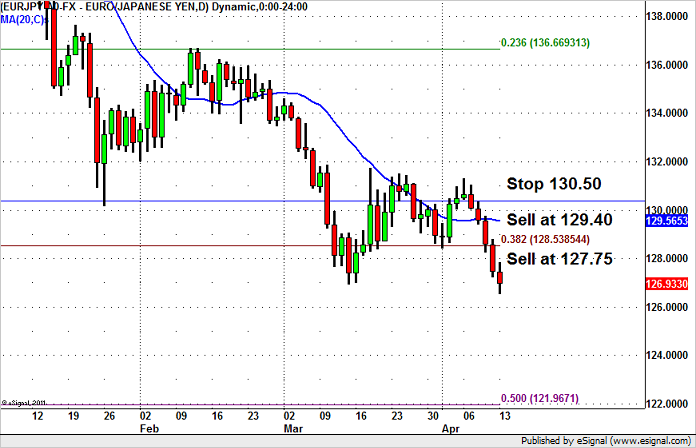 While CAD/JPY could bounce off support at 96.50, the charts signal an eventual move down to 95.35 as long as the pair remains below 97.60, the level at which the 38.2% Fib and 100-day SMA converge. We like the U.S. dollar and strongly believe that it will see further gains in the months ahead as market participants position for a summer rate hike. In the past few weeks, we have scaled in and out of the dollar, capturing parts of the dollar’s bull run. At this stage, we are still looking to join the dollar rally but given how quickly and significantly the dollar has rallied over the past few weeks, the risk to reward has become extremely undesirable. The dollar is due for a correction and while we are not sure if this will happen this week or next, we want to our orders out there when they do. 3. Know when to quit and walk away with your profits. Watch as we bank 30 pips in 30 minutes. Risk on our BIG TRADES is large, so make sure your position is small. We will manage the take profit dynamically and send out alerts on when to take profit and/or move your stop. A few weeks ago, we bought ourselves some NZD/CAD on the premise that dairy prices would bottom before oil. Today, oil prices are down 4% while dairy prices settled at higher levels for the third auction in a row. We traded the currency pair, taken money off the table and are now shifting our focus to the ultimate carry trade -- NZD/CHF. Lets start with the New Zealand dollar. NZD fell sharply today on the back of a more modest increase in dairy prices. While it would have been nice to see dairy prices rise by a larger amount, the fact that prices increased at the last 3 auctions is GREAT news for New Zealand. Earlier this month, dairy prices rose 3.6% the biggest increase in 12 months -- matching that pace would have been unrealistic. Considering that dairy is New Zealand’s biggest export earner, accounting for approximately 30% by value, this increase will bolster the confidence of the RBNZ who meets next week. The last time we heard from the central bank, they were surprisingly comfortable with the current level of monetary policy and while they felt that the New Zealand dollar value was unjustified and unsustainable, they also believed that further policy adjustment will be necessary after a period of assessment. In other words, they are still looking to raise interest rates -- eventually. Their hawkish monetary policy bias and 3.5% interest rate will prevent NZD from falling much further and instead lead to a recovery in the very near future especially if the ECB rolls out Quantitative Easing, forcing investors to look elsewhere for yield. 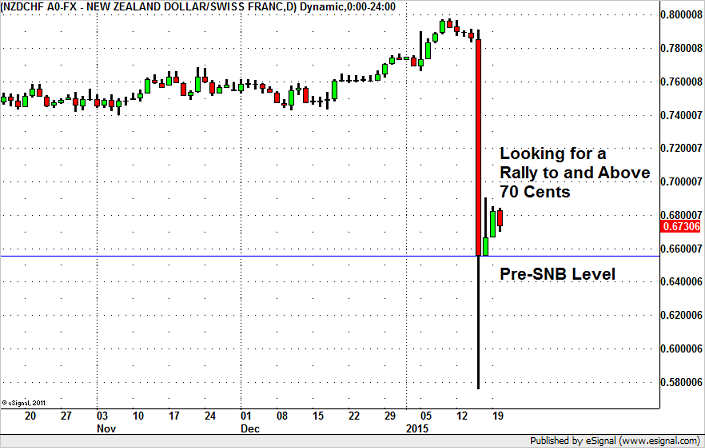 Buying the New Zealand dollar against the Swiss Franc is the ultimate carry trade. In addition to abandoning their 1.20 peg, the Swiss National Bank also deepened the negative rate environment by cutting rates 50 basis points to negative 0.75%. Last week, the SNB made the conscious decision to shift from exchange rate to interest rate driven monetary policy. If the recent appreciation in the Franc poses a major threat to the Swiss economy, they could lower interest rates further -- increasing the attractiveness of selling Francs. Even if they don’t and other central banks lower rates, NZD will become more attractive as a result. We also believe that most if not all of the long EUR/CHF trades have been flushed out with all stops already triggered. Chart -- NZD/CHF Headed for 70 cents. There has been quite a bit of action in the FX market this week and over the next 48 hours, we have a significant amount of Canadian and Eurozone data that could accelerate some of the moves in currencies and to take advantage of this opportunity, we are laying out 3 trades. 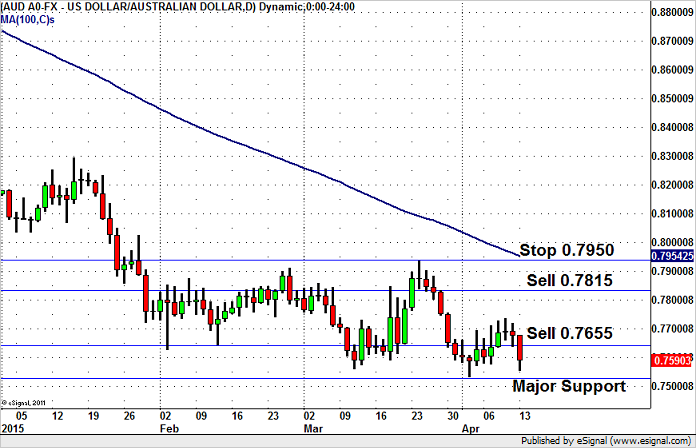 The first is a TrendCatcher USD/CAD short trade. We like this trade because it has the momentum of the Burger King / Tim Horton deal and the catalyst of tomorrow’s Canadian current account balance and GDP report. This trade is taken at market. The second is a pending order to sell EUR/NZD on the belief that over the next 48 hours, EZ data will surprise to the downside. The third is also a pending order to Buy EUR/CHF on the belief that the SNB won’t allow the currency pair to drop below 1.20.